Albert J. Ricciuti : A war, a love, an inheritance. Albert Justin Ricciuti was born in 1923 on Lakewood Avenue in the east of Baltimore, Maryland. His father Raffaele, an Italian immigrant who had arrived in the United States at the beginning of the 20th century, had spent many years before understanding English. He had then joined the allied expeditionary forces and returned to Europe in 1917 to fight the German Empire. He had met Louise Pillier, a young French girl, who became his wife and joined him in his adopted country after the war. 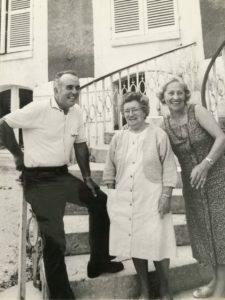 Following this international union, their son Albert grew up in Baltimore for years and then graduated from the Mont St. Joseph High School in Irvington in 1941. Thanks to his parents’ origins, the young man speaks several languages ​​and it is his level of French which will interest the army during the Second World War. 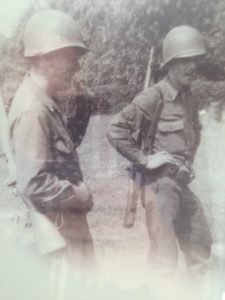 Albert also enlisted the army on January 22nd, 1943, and obtained the serial number 33552009. 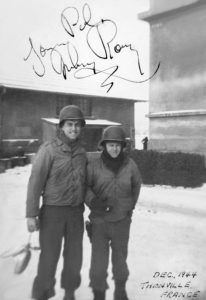 He then joined the 20th Corps of the 3rd Army of General Patton. Transferring quickly to Great Britain, he landed on Utah Beach on June 10th, 1944, 4 days after the start of operations in Normandy. Then its unit moved according to the progress of the operations, crossing the liberated regions of France one after the other, including Champagne. It was in Champagne that the young soldier, then twenty years old, met Paulette Révolte and his two sisters at Avenay-Val-d’Or. Through the practice of French, Albert and his comrades have more facility to communicate with French people. Beer lover, he discovers during his stay a new drink: Champagne, through good times spent with Paulette, who grew up in the vineyards. Then the front progressed and Albert finished the war and returned to the country while others did not have that chance. He then occupied a small barman job at Chiapparelli’s in Little Italy. However, once back, he has not forgotten the beautiful Paulette to whom he writes a greeting card every year during the Christmas period. « I have so many new bottles of champagne to taste». The lovers will marry a year later, eager to catch up all these years passed far from each other. Some formalities in the USA will be settled and Albert will move to France, in the village of Paulette. 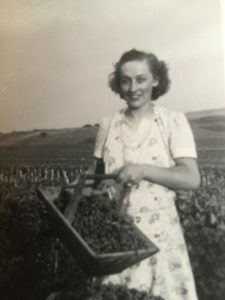 He was trained in wine and grape growing in the company of the Paulette family. In spite of himself, Albert Justin Ricciuti of Baltimore had just become the first American to produce Champagne. 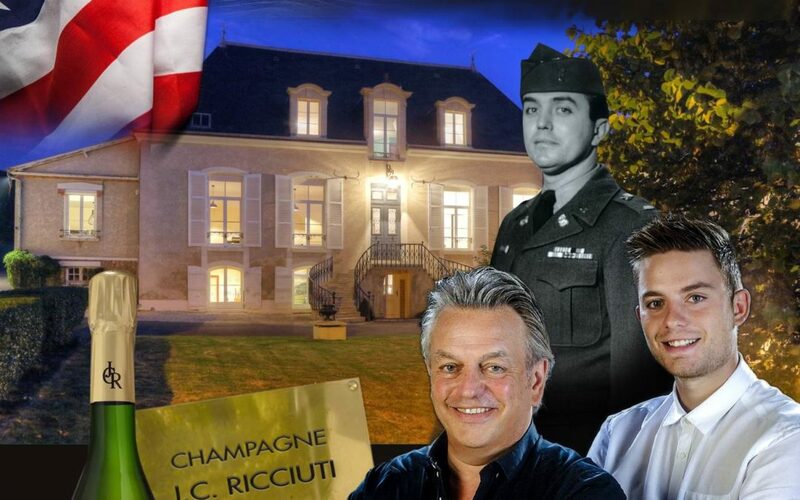 Wanting to learn constantly, Albert became a leader of the sector and the Ricciuti-Revolte Champagne was produced at no less than 50,000 bottles per year. Albert Ricciuti, Hero of the Libertation of our country, passed away on June 17th, 2002 and Paulette unfortunately joined him on December 12nd, 2016. However, John Charles was born of this love in 1963, with an American father and a French mother. This son bears the names of two Franco-American symbols; John F. Kennedy, president with the tragic destiny, and Charles de Gaulle, leader of Free France during the war then president of France; and now thanks to his work the family business continues, the inheritance of a meeting and a unique know-how. Today he is proud to transmit his History and that of his name. It would appear that his son Ugo, who has just completed a BTS winegrower is already ready to take over and continue the tradition!